If you have AirPods, you probably love them. The design is so cool, of course, and the sound quality is surprisingly good for cord-free earbuds that are so compact. But what you might not realize is that they can sound so much better if you manage to get a good seal in your ear to isolate the sound, but that’s next to impossible since they’re made out of smooth, slippery plastic. That’s where the AhaStyle AirPods Covers come in. These covers fit your AirPods perfectly and the silicone offers great grip so they stay in your ears like normal earbuds. 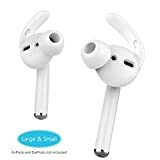 They’re on Amazon right now for $13 for a set of two pairs which works out to under $7 each, and it’ll be the best money you ever spent if you want to get the best possible sound out of your AirPods.